Thirteenth Annual Pomegranate Group Show. Ann DiSalvo, Denise Souza Finney, Ruthe Woudenberg, Rachel Barrett, Mori D., Ellen Falkner. Figure studies from their weekly meetings, practicing together for a positive influence on personal creativity. Studio A.B presents six artists’ works in varying mediums, all results of ongoing studies of the female form. 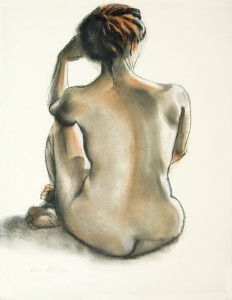 The Pomegranate Group is the longest standing women’s drawing group dedicated to this genre, meeting weekly to pursue depictions of the ever-changing nature of women’s bodies. The style each artist brings to the exhibit indicates the potentially endless points of view by which to see the feminine form. Chocolate will be on hand both to honor the Oregon Chocolate Festival and to express the artists’ belief that women and chocolate have a special relationship. The Group chooses to exhibit in March to be a part of Women’s History Month.